Indiegala is hosting a Golden Flash Giveaway, where visitors to the online game retailer can get AAA games for Free. And you can get a new game everyday. Now, what games are they offering? According to the official page, these are what you can get. You can instantly win EVERYTHING from indie gems like GooCubelets, Memories of A Vagabond, Millie, Jack’s Gang and Gunspell to sprawling AAA franchises like Dark Souls, Sniper Ghost Warrior and Dragon Ball! So, basically it looks like you could get any game on the Store. But there is a catch. The game that you will get is chosen randomly. So, you may win a great game or a really bad one. Who cares, free is free, right? The bad news is that you could get a game which you already own. Even if you don’t win a good game, you could earn some trading cards, which you can sell for Steam Wallet Credits. 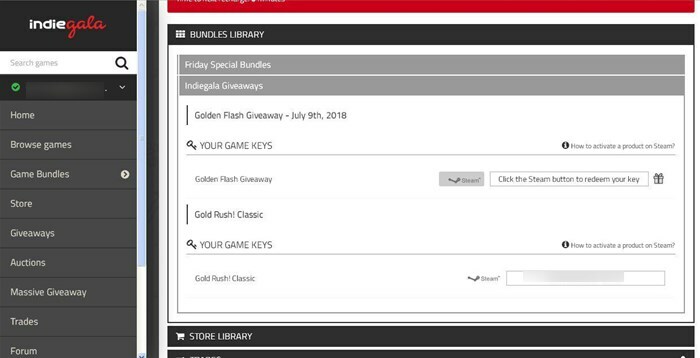 How to get AAA games for free from Indiegala giveaway everyday ? 2. Click on the menu and select “Massive Giveaway”. You may not see this option if you are checking it too late. The giveaway only runs during the late afternoon in UTC time. 3. Close the widget which appears on the page, and hit the submit button. You will need to check the captcha. 4. That’s it. Go to the menu > profile > libraries > Indiegale giveaways, and you will find your game key, which you can redeem using the Steam game client. There is no Facebook or Twitter requirement. It’s just a plain old login and get a key method, and that’s what we like, don’t we? Now, we don’t know how long Indiegala would keep this promo active, but remember you can get AAA games for free everyday. Keep checking back everyday and maybe your luck will land you a good game.